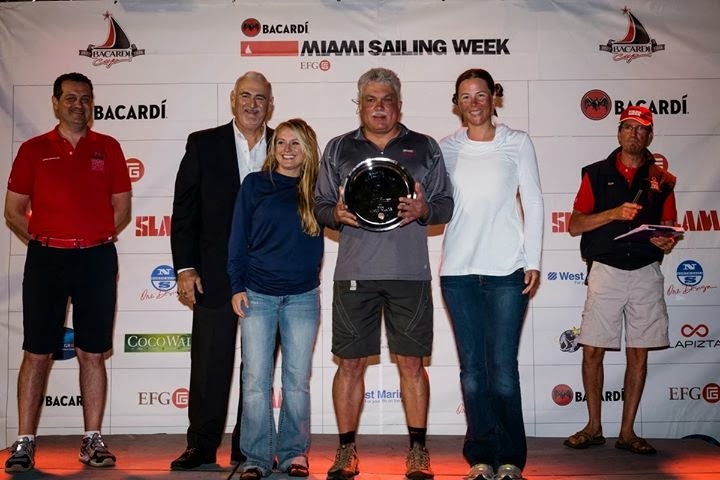 March 5-8 we competed in the Baccardi Miami Race Week in the Melges 24. We had a couple of days of practice with our coach (Ed Adams) followed by 3 days of racing. The first day of practice we had moderate winds and did some general practice. The second practice day we had lighter winds and did a lot of drills working out with the Italian Team Little Wing and the US Team 300. The first day of racing we had moderate breeze -- unfortunately in our first race we caught the mooring line for the pin boat and wrapped it around our keel. By the time we got this sorted out we started last by about 5 minutes, although we clawed our way back into 3rd. Our races got progressively better and we finished the day 3-2-1, beating the excellent Italian team in the last race. The second day of racing was one we won't forget for a long time -- warm, sunny and building offshore breeze that started 18-22 knots and built to 24-28 knots. We had great starts are were launched for each of the three races -- we tried out some new crew positions and were gibing better than ever with downwind rides of 18-20 knots. As the winds built there was a lot of carnage -- the M20 fleet lost about 10 rigs and there were frequent crashes. We finished day two with a 1-1-1 and were very tired. The third day of racing was a complete bust -- no wind but the race committee kept us out there until 1:30pm -- they tried hard but it just didn't happen. We were early to the hoist line up and managed to have the boat mostly put away in time for the awards. The net-net is that we finished ahead of the excellent Italian team and won the regatta taking home a nice Baccardi Pickle Dish! A great event and one that we will have to do again! Here is a great video put together by the race organizers for Friday -- Mikey was features in a number of the segments, although we are really far ahead of the fleet most of the time and didn't get involved in the tight mark rounding situations and other interesting moments.